The people who flocked to the World’s Fair fifty summers ago might remember the day a computer—likely the first they’d ever seen—read their handwriting. In a pavilion built by IBM, the public wrote down dates from the past, and a mainframe computer displayed facts about what happened. Maybe more than anything else, this information retrieval system would give fairgoers a taste of what the future would be like. For its fiftieth anniversary, let’s recall the unveiling of the future that was the 1964-65 World’s Fair. 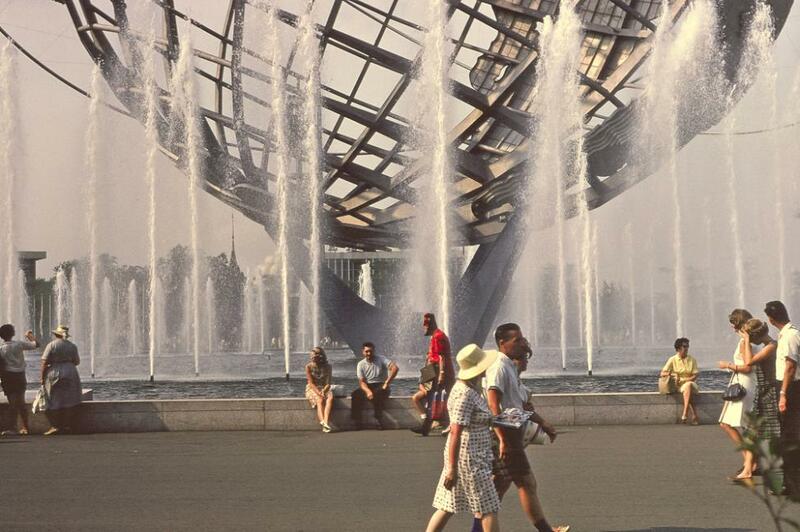 Conceived by a group of New York businessmen in the late 1950s, the World’s Fair spanned two seasons in Queen’s Flushing Meadows Park. The idea was to showcase major national and industrial advancements of modern, post-war civilization, especially consumer goods and communication technologies. New York was the ideal setting because, it was argued, New York was the capital of the modern world. More than fifty million people attended from all over the globe, and the fair became a major cultural touchstone. Here are a few promises it made that the future eventually delivered on. Communications technology was featured heavily in a fair that focused on the “shrinking globe.” On April 20, 1964, the first transcontinental video conference was completed on an AT&T “picturephone” in a large public display. In the 1960s, AT&T thought there would be a large demand for public videophones, and so they were installed in places like Grand Central Terminal. Because it cost the equivalent of hundreds of dollars to make a video call, though, the public was not especially interested. Recently, however, personal “picturephones” have proven to be quite popular. It was considered futuristic to launch humans toward outer space with force enough to escape the earth’s gravitational pull, direct them toward the moon, land them on the moon, let them explore the moon’s lethal low-gravity environment in protective suits, and welcome them back to earth a few days later. That all happened. It was broadcast worldwide on television. People thought it was pretty cool at the time. Fairgoers were promised jetpacks and trips to Mars, but it turned out that what the masses really yearned for were high-performance sports cars. Ford debuted the Mustang at the start of the fair and included it in its Magic Skyway attraction, one of the fair’s most popular. Conveniently, you could also check out a Mustang at your nearby Ford dealership. The future was here, it was all around, and it was fast and cool. At the height of the Cold War, many people thought the human species would have to burrow underground, and maybe sooner rather than later. And what better way to wait out the radioactive fallout from a nuclear war than in a stylish, well-appointed lair? The Underground Home was designed by Jay Swayze (no relation to Patrick, as far as we can tell), a Texas builder who moved his own family into a luxurious subterranean mansion to show his community that it was awesome. At the World’s Fair, he got to show the world. Today, many people imagine escaping all sorts of unlikely problems in buried bungalows. It’s even possible that the Underground Home exhibit itself still lies silent and undemolished beneath the Queens fairgrounds.